Truthscoop - Via TV etc. There's an argument for 'no borders' but it's not mainstream. Goes with anarcho social orders. Or, a Marx-led breakdown, the build-up out the ashes bringing supposed benevolent authoritarianism. Once that is, the Left has entered into a fight to the death in the semifinals against Anarchists. Finals, and who mops up the last of the agitators. Of course, these tagged 'radicals' are low in popularity. A lack of those willing and gathering at the grassroots. The only hope they think-have is in violent discontent. Somehow in the chaos, the numbers open up and come knocking on their respective doors. Do they imagine overcoming the ones who want no-borders, city-state, one world order-ing? How do they expect to counteract bio-weapons and a prison planet into its full reach? One reason why the self-disclosed plans by the elites aren't considered. It ruins these revolutionaries' theories. What to do, is at least, their valid plea. Rather than the pretend-all-roll-on as about is. Urgency and imminent changes -vs- believe the Govt. hype. Leaving aside those sincere and upfront militant ideologues, the media-lot are... the extremists. Playing with fire. Professionals announcing menace to the world. Western terrorists. Using information as their weapon to stir and inflame the vulnerable. Add false-flags by spooks to complete the equation. The UK is set up to see a 'Neo-Nazi/Extreme Right attack' to follow, or proceed, a typical said-Muslim one. Since there are only handfuls of little-watched internet outposts trying to alert. The silliness of the prescribed narratives ignored by the 99%. The ground is secure for more schoolboy level whitewashes. The media operatives themselves, assume whatever smoulders and burns, will get put out. These smarty sounding pundits are the face and reach of the criminal elite. There can be no maintaining the line, it needs increasing, the manipulation. For example, 'Syria' has been an exceptional lie-fest, yet the consequences for the UK pop. seems minimal. What does rile up on the domestic front is immigration. Wind-up resentment firing the vulnerable into revenge. Most m.s.media are political progressives. To keep the slap the Judy show going are their blunt counterparts. Conservatives, who are pushing for public restraints or no-more-Muslims. Ok, the nice ones... they'd say. Once 'their religion' is all but banned and neutered. Fight fascists. Fight commies. Fight, fight, fight... all via T.V. etc. cheerleading the crowds and powers. The 'law' makers ready to push cops in the middle and blame... someone, anyone, but themselves. The fire-starters. Israel Shamir's, daylight clear Keep Babies Out is about the deception. The shying from admitting the deeper message. Or, themselves duped by superficial nonsense. Else, duping because of the need for this, to back confirmed bias. Do the bidding for the banker-lot death cult -- in the name of Government. 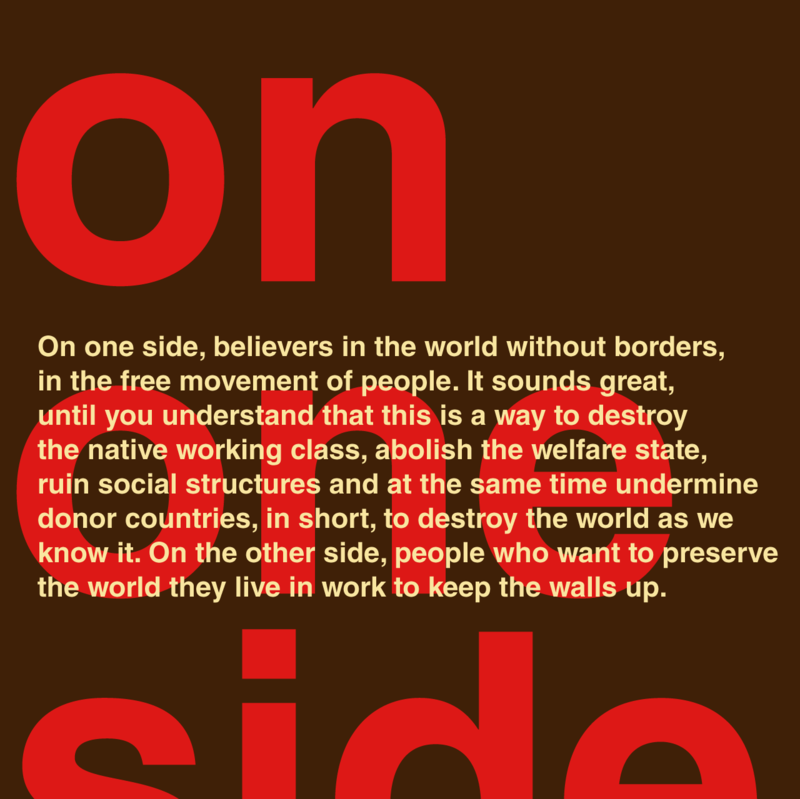 On one side, believers in the world without borders ... On the other side, people who want to preserve the world they live in work to keep the walls up. Politics has nothing on pride and prejudice for power. We're all so techno-driven arrogant these days. It's boiling over and a way to deal with the dilemma is hate. Lash out in a desperate escape. While: All we need is love -- couldn't sound more twee and trite but is the all-we-have otherwise. A prophetic song for our times; 'The revolution will not be televised' is about, '...the revolution will be live'. That TV (etc.) spectates in control and one day won't keep up. It's true today in the black-outs are ready and there'll be 'national security' silences. The added revelation is TV and all, is the revolution. Make-up the news for the set purpose to poke and push us into social self-destruction. The US might need a distraction from currency collapse and wider war. In the meantime, the about-race war is being whipped up by the suits and skirts. The Terrible-Visionaries.